Though it took 25 years to do so, the L.A. County Coroner&apos;s office has finally identified the last unknown victim of the 1992 Los Angeles Riots. His name is Armando Ortiz Hernandez, and he was 18-years-old when he died. Until now, Hernandez has only been identified only as John Doe No. 80, according to the Los Angeles Times. His body was found on May 2, 1992 inside the smoldering remains of a Pep Boys auto repair store at intersection of 58th Street and Vermont Avenue. The store had burned to the ground a few days prior. LAPD officer Jorge Macias was the first patrol officer to formally find the body back in 1992. As he told the LA Times, he remembers how a boy about 10-years-old flagged him down, and said "&apos;Officer, there&apos;s a dead guy in there!&apos;"
"The boy pointed beyond some fallen girders which had fallen at acute angles ostensibly from the roof, when the roof had given way, sealing the victim&apos;s fate," said Macias to the Times. "I had to duck-walk under the maze of obstacles, including the blackened steel beams, until I reached the remains." The body was badly burned, and the only identifying features for coroner&apos;s investigators to work with were a few teeth and a partial fingerprint from Hernandez&apos;s left middle finger. As Ed Winter, L.A. County Coroner&apos;s deputy chief of investigations, said to CBS News, Hernandez died of "inhalation of smoke, soot, carbon monoxide and thermal burns." His death was ruled a homicide after fire investigators determined the fire that consumed the Pep Boys was intentionally set. Hernandez&apos;s identification last month was only possible with that partial fingerprint. As Winter said to the L.A. Times, "We tried many, many times over the years. Every couple of years, someone would pick up the file, Finally, we did it." This time, the coroner&apos;s office sent the fingerprint to an FBI team that specializes in identifying unknown victims from Hurricane Katrina, and the September 11th, 2001 terrorist attacks. Hernandez had been arrested a couple of times for minor offenses in L.A. and Orange Counties, meaning that investigators found a fingerprint match when they ran an exhaustive database search. Following the positive identification, the Coroner&apos;s office contacted Hernandez&apos;s only known relative, a sister who currently lives in Mexico. His remains, however, were cremated long ago, and buried alongside other unclaimed and unidentified remains at the L.A. County Cemetery, in Boyle Heights. 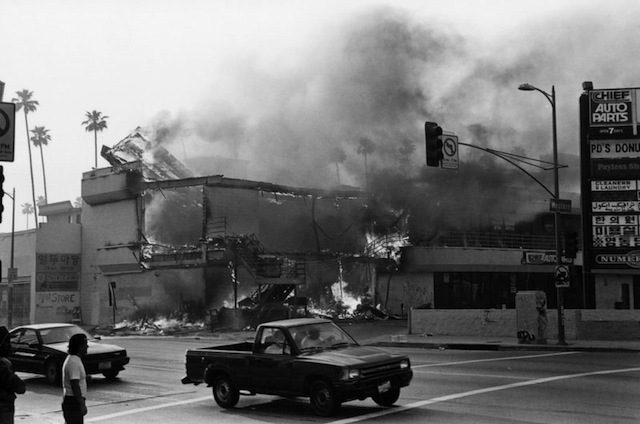 Hernandez was the last unidentified victim of the LA riots, which killed 53 people during the last week of April and first week of May of 1992.